It’s such an all time classic from 2006 that people even kept scans of the original 2006 Computer World publication by [WayBack] John Klossner. Over the last few years, it has done its round over the internet a few times, so I did some digging for the scans, colour and mono originals. 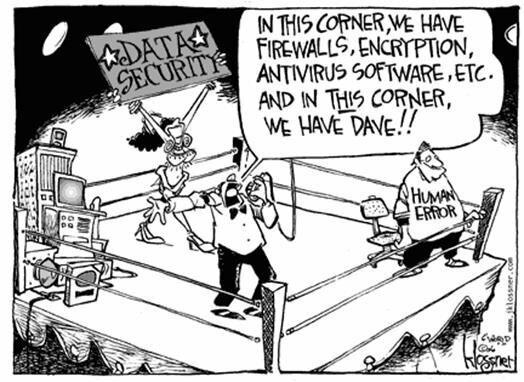 Data security versus Human Error. 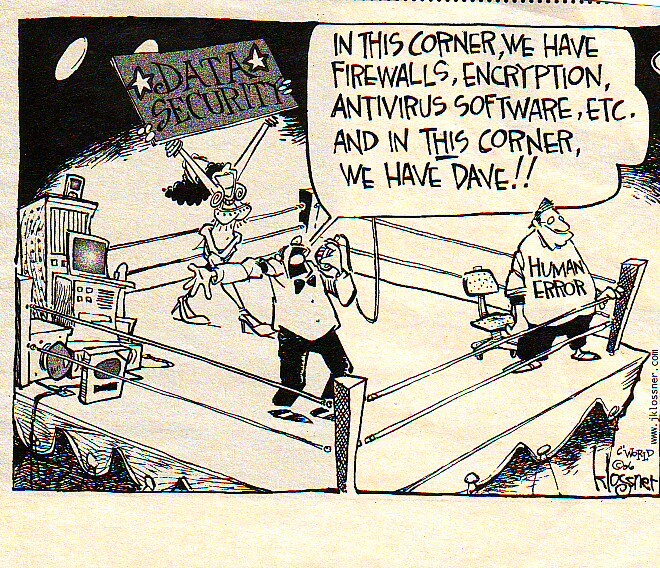 In this corner, we have firewalls, encryption, antivirus software, etc. And in this corner, we have Dave!! [WayBack] John Klossner Cartoons: Computer World has the original black and white version: it’s even a gif! It looks like the Nest needs to communicate wirelessly with the Heatlink in order to support OpenTherm. I can’t find what frequency or protocol the Nest/Heatlink connection uses. But lots of people still report overshoots in temperatures. Wat is de Heat Link? Hoe communiceren de Heat Link en de Nest Thermostat met elkaar? Nest devices interconnect with each other using a protocol called Weave, which is based on IEEE 802.15.4 and Wi-Fi 802.11 b/g/n. which seems to indicate it operates mostly on 2.4Ghz (which is distorted when neighbours use their Microwave to heat food). David Hill – of ThinkPad design fame – is going beyond “Black Paint”. It means he will be far less involved with [WayBack] ThinkPad: Industrial design, more with other design and – very important – his loved ones. Today I’m announcing my “rewiring”. I want to broaden my view and create the opportunity to do more in the field of design.